Guest post by Jennifer Monahan. that you love, but make it appropriate for many other occasions. accents of a faded pink or dark red. 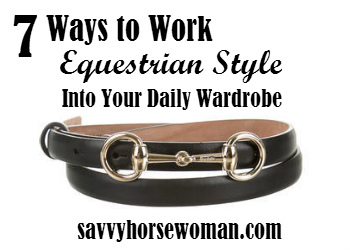 think of when you consider working equestrian style into your wardrobe. and understated way to go equestrian chic. whole feel of the outfit (for inspiration see Mack & Jane Artisan Equestrian Cuffs with charms, pictured here). leg or are complete sleek with a lack of seams or pockets. also use them to cinch in the waist of your sweater or dress. list, however, or you will go into that dreaded costume territory again. 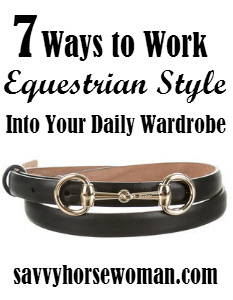 and don’t afraid to add some equestrian chic accents to your everyday wardrobe! The riding boots tend to go with me everywhere, indeed! Love the bracelet pictured. Yes mine do too. I love my cowgirl riding boots and usually always wear them with all my outfits since they look so good and stylish. This Collared shirts and charm bracelets looks superb.